We may take it as granted that there was a Celtic settlement previous to the Roman occupation on the red sandstone bluff above the Exe, and it will also be granted that a passage of the river existed, and that after the town was walled that passage was approached by the West Gate. The line of the old bridge we know, since we have it given us in the arches still existing, to be seen by courtesy of the owners of the property at that spot. The thirteenth-century arches of excellent masonry are associated with the name of Walter Gervase, Mayor. It will not be contended that the main line out of the City was the abrupt turn southward, now the Alphington road, nor that it was the narrow lane to the N.W. known as Okehampton Street (by Whitestone). But in line with the old bridge, which crossed the river several yards lower down the river than the present Exe bridge, is the straight St. Thomas’ Street, and it is clearly the main road out from the West Gate, for in some places the houses still lie back at its original width, a broad and important thoroughfare. Over Bow Hill, and across the Alphin brook, at Rolls Bridge, we begin the ascent of a long ridge of downland, the first part of which is known as Longdown, a parish boundary with us. At Longdown End, the boundary still accompanying, we keep the ascending road towards Holcombe Burnell, and shortly it describes a semicircle, keeping to the rim of the combe in which Holcombe Burnell lies. The semicircle is both road and boundary. A Roman road in Wiltshire makes a detour around the head of a combe precisely as does the way we are now traversing, then resumes its original direction, as this also does, though an older road. It leads north-west, gradually trending westward. In bygone ages when valley bottoms were undrained morasses and the hillsides dense forest, the easiest and most natural way of passing through a country would be to keep along the ridges or long stretches of high ground between valleys, and we are certainly justified in regarding these ridgeways as the very earliest lines of communication. Moreover, the high lands being often poor soil would be more open country, and the heathlands of to-day perhaps present to us their original state. The name of our way is preserved to us, for the great down along which it runs is still called “Hackway Down”. Antiquarians have maintained that the Icknield Way led westward to Exeter, and that name is given on the Ordnance Survey Map to the old street leading down from Carfax to the West Gate. Is there preserved in “Hack” the syllable “Ick”? Compare the vernacular pronunciation of “Ipplepen” – “Æplepen”. In places the full original width of the Hackway is seen, and a parish boundary is with us the whole length of the down. After the crossway at Three-Footed Stool, the old way, no longer used by the public, but called “my road” by the local farmer, leads down to a ford over a very small brook, ending the first long ridge from the Alphin stream. Then commences a second rise towards Fulford Lodge. At Windout Farm Lane, estate alterations have slightly changed its course, but the through-way exists along the north side of the Fulford Park, past Melhuish Barton, and, now a mere cart-track, keeps along high ground towards Cheriton Cross, here once more a boundary. The line of its original direction to the present Cheriton Cross is quite clear, merging gradually till it is the great western road. The soil here is a vicious clay, and there was imperative necessity to avoid the hollows, where the hapless traveller would soon get “stogged”. At Polford the second long ridge ends, a small feeder of the Teign being crossed. The older crossing is seen at a point eighty yards north of the present bridge-site, due to road straightening. The third great ridge commencing, and Crockernwell passed, a boundary is again with us. The road, originally wide, is still so even to eighty feet between the bounds, in some parts. Cottages are squatted along its margin and gardens enclosed. The trees by it on either hand and coppice on its wastes give beauty, and afford protection to travellers from winter storms on this grand high road. Leading still westward, it rises to over eight hundred feet, affording magnificent views. Its old name “Harepath” (Herepath), the great military road, or Warpath, is preserved in the name of a farm near Harepath Cross, a name which occurs near Seaton (Trans. 1885, p. 195). East of Hooperton a straightening has been made, for a parish boundary leaves us, runs along southward and joins again later, perhaps indicating a former bend of the old way. The road is on a watershed ridge between the basins of Teign and Creedy. At Whiddon Down a boundary is with us and then runs parallel for a great distance on the north side, showing where the bound of the wide road formerly lay, land having been filched from the public. After Whiddon Down a height of about nine hundred and fifty feet is reached before descending to end the third great ridge in the hollow where lies the picturesque village of South Zeal, with its cross and ancient way-chapel in the centre of the road. In the dip a feeder of the Taw is crossed and that river itself shortly after, at the village of Sticklepath, so named from a sharp rise over a spur of the moorland. Above the spring known as Ladywell is the shaft of a cross, its Celtic ornament clearly visible, a piece of evidence as to the ancient character of our way. The present road avoids the steep climb, and at Tongue End the old and new roads coalesce. We have now reached a summit-level whence streams flow in three directions, where our present road is crossed by the Fosse Way (Trans. 1915, p. 303) leading from Somerset by Cullompton and Bow, passing over a shoulder of the Moor on its way to Launceston. So wisely did its makers rise to the higher ground rather than sink to the valley in selecting their course towards the west that the engineers of the L. and S.W.R. have laid out their line practically parallel to it, any other route for the railway being out of the question. Having descended from the summit-level to the crossing-place of the Ockments, we have in the wide street between the two bridges another way-chapel, St. James’ Chapel, in the town of Okehampton, where may still be heard the true sound “Ock” in pronunciation of the town-name. The Saxon settlement arose where the Celtic way crossed the two moorland streams. We follow the way up the steep ascent still keeping a westerly direction, passing near the parish church. The great width of the way is seen by the existing bounds, in some places fifty paces apart. After the dip at Yelland, the great down commences which carries a ridge-road for many miles, a bank of high land whence old ways lead over an immense tract of country, the important and dominating watershed of Broadbury Down. This vast down, studded with barrows and tumuli, its highly strategic position recognized by the Roman military power, has on it a four-sided and extensive camp, its earthworks now all but levelled. Along the ridge runs the ancient way. The down parts the valleys of Torridge and Tamar tributaries. At the western end is a road fork and at the road fork prehistoric Henda-barrow, of sufficient mark to give name to a neighbouring farm. One of the two roads keeps to the water-parting between Torridge and Tamar basins, and, crossing no water but the heads of a few trifling streams, leads us with various bends the whole long distance right away to the neighbourhood of Hartland, very clear evidence of high antiquity. Moreover, of the way that we have thus far traced from Exeter to Soldon Cross, between Holsworthy and Bradworthy, not less than twenty-two and a quarter miles are parish boundary. Northward from Broadbury another old line of way leads, mostly on water-parting land, till it reaches the tidal waters of the Torridge. Also from the same extensive down other old ways lead southwest into Cornwall, and thus the early through-route from Celtic Exeter is seen to be one with these long communication-lines. (To refer for a while to another matter, the connection with which will be seen later.) In Trans. 1889, p. 431, Mr. R. Burnard, a member whose knowledge of the Moor is both intimate and extensive, in his paper on the Great Central Trackway of Dartmoor, maintains that the paved way is one with a great through-route from Exeter via Chudleigh into Cornwall, and that it is identified as none other than the renowned Fosse Way. The writer of the present paper regrets that he is unable to agree with that author, for it may well be questioned whether so practical a people as the Roman conquerors would deliberately go out of their way to pass through the difficult country between Chudleigh and Hameldon, make a supererogatory climb over that great hill, then lead their road till “it climbs the steep up to Little White Tor, where it is lost.” Again, “It runs into the centre of the Tor, and appears to end abruptly.” Quoting again from Mr. Burnard, “finding the missing link running up the slope of Rolls Tor, where it was again lost in the clatter and boulders forming the summit.” Are not these strange doings for a Roman way? In the present writer’s opinion the paved causeway on the centre of the Moor is a ceremonial way, appertaining to the period of stone avenues, groups, circles, menhirs and other memorials of the past, of which only a poor remainder now exists of the vast number once covering the wilderness table-land. The line of the causeway, lying E. and W., and the manner in which it passes from tor to tor, and the absence of continuation with the country at either extremity make one doubt that it could be the famous Roman way, for it should be remembered that to lose such a road would be like losing Watling Street or a trunk line of railway. (To return to the summit-level where the paved Roman Fosse crossed the Celtic track, the constructed road passing over a shoulder of the Moor (Trans. 1915, p. 299) descending by Meldon and Youlditch in a direct line for Launceston.) When in course of time there grew up the township of Okehampton, travellers by the Fosse, instead of going up over the shoulder of the Moor, would go to the town by the road leading directly thither, and the point at which they changed from one road to the other is seen to-day in a short piece of lane across the angle (see map). The above-mentioned paved way fell into disuse as convenience of the growing town attracted travellers, whose road westward was then up on to the high ground towards Broadbury, without, however, going the full distance, for we have evidence from the Court Rolls of Bratton Clovelly, in a valuable paper by the late Rev. T. W. Whale (Trans. 1895, p. 144), by which we are able to avoid conjecture, and get authority for every step of the way. “Duodecim jurati dicunt quod via regia apud Hedysdone forde est lutosa et profunda ad nocumentum patrie”, etc. Again in the same year (1377), “quia non emendaverunt viam regiam apud Hethdone forde que est lutosa et profunda”. “Duodecim jurati presentant quod via regia apud Wykes hill est profunda et lutosa”. “Item via regia apud Chemysworthy est lutosa et profunda”, 1378. “Viam regiam lutosam apud Wykyshille et viam lutosam apud Chemysworthy 1422”. “Via regia apud le fosse in parte boreali de Brattone est lutosa et profunda”. “Vocata le fosse” in the other courts. “Viam Regiam inter Regestone et Westbornebury”. The places mentioned are Headson, Wrixhill, Chelmsworthy, Rexon, West Banbury, and the roads are readily identified. The way from the higher ground past Chelmsworthy was easy to travel, a “via regia”, and the curve round by the knoll on which Bratton Church stands may be observed to-day. The dwellers in that region of clay are well able to sympathize with wayfarers when roads were not merely “muddy” but “deep”. By the wayside in Bratton a fair and market were held and it is noteworthy that the church was being rebuilt in the fourteenth century, and would have made a magnificent structure, far exceeding the usual village church, had the work been carried to completion. Traffic now through the village can scarcely be said to exist, so retired is its situation. The “via regia” by Chelmsworthy gradually branched from the main ridge road, and at the village divided, each part being named “via regia” – one by Wrixhill to strike the direct road at Lew Down Cross, the other by Headson, West Banbury and Rexon, in a direct line to Lifton Down, both being easy roads. The road over Old Street Down (Lew Down) can never have been derelict. 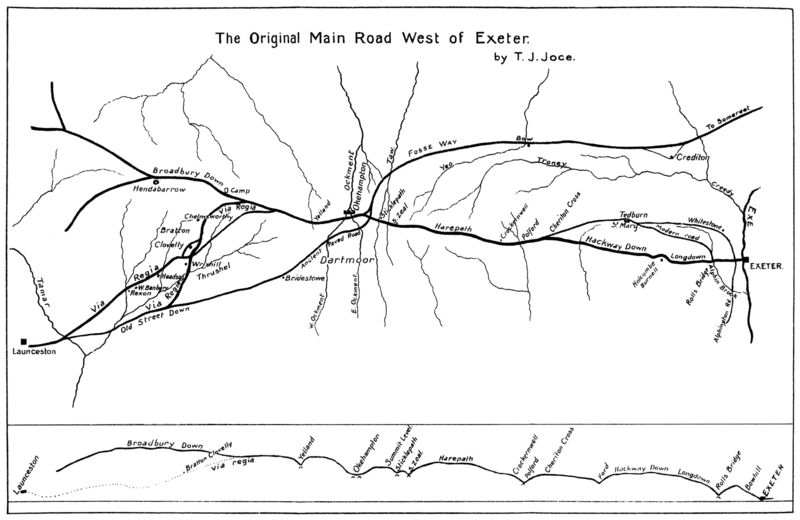 The route described above from Okehampton formed a loop along the north side of the Thrushel stream as the direct road from the shoulder of the Moor took the south side, and to the loop was transferred the name “Fosse”, which was of course the name of the road to eastward as well as to westward of the loop (comp. Trans. 1915, p. 303). From the Celtic settlement above the Exe traffic passed by Celtic ways to the Celtic hill-city of Dunheved (Launceston). The surface of our loved county is the palimpsest of its history.